In February, Rafael participated in our Create a Commuter program in partnership with Easter Seals, a nonprofit organization that provides services, education, outreach, and advocacy so that people living with disabilities can live, learn, work and play in our communities. 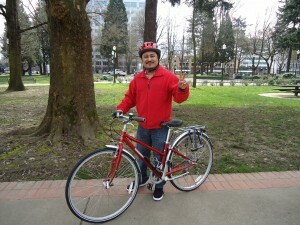 During the workshop, Rafael and a group of Latinos earned a bicycle while learning mechanical and road riding skills. After the workshop, Rafael was so eager to ride his new, red bike. A month later, I was curious to know how it was going for him, so I checked in with Rafael on a sunny, Friday afternoon. Rafael moved to the United States from Guatemala with his wife to help provide for his two young daughters who are his “daily inspiration and motivation.” When he was a child, Rafael suffered a serious injury and unfortunately it was left untreated due to lack of services and money. Rafael’s disability does not allow him to walk long distances without pain, thus bicycling is a key aspect of his mobility. Rafael shared with me how he depended on public transit to get around. The closest station is a 30 minute walk away from his home, which used to leave him exhausted and in pain. With his new bicycle, he can get there in half the time, be energized, feel great, and ready to work! Occasionally, Rafael rides the entire distance to work. His friend, Federico, is a car owner, but chooses to ride to work with Rafael for exercise. “Riding a bike is a lovely experience,” added Rafael. This bike was not Rafael’s first; someone stole the last two bicycles that he owned. “The bikes didn’t even look as nice as my new one,” he explained. He bought them used, but they were in poor working condition and did not fit him properly, causing a lot of discomfort and pain. “Now that I have a well equipped, perfect fitting and working bicycle, I park it inside my house to make sure it does not get stolen.” And when he rides outside, he is able to lock it properly, after learning about safe locking procedures in the Create a Commuter workshop. Rafael has never owned a car. He does not have a driver’s license and never learned the rules of the road in the United States. “I used to ride my bike like a tonto [not obeying rules of the road],” he admitted. One time, the police pulled over Rafael due to his unsafe riding habits, but let him go with a warning. Thanks to the Create a Commuter program, which focuses on safe riding, Rafael now understands the rules of the road. “It isn’t safe to ride like that,” he added. 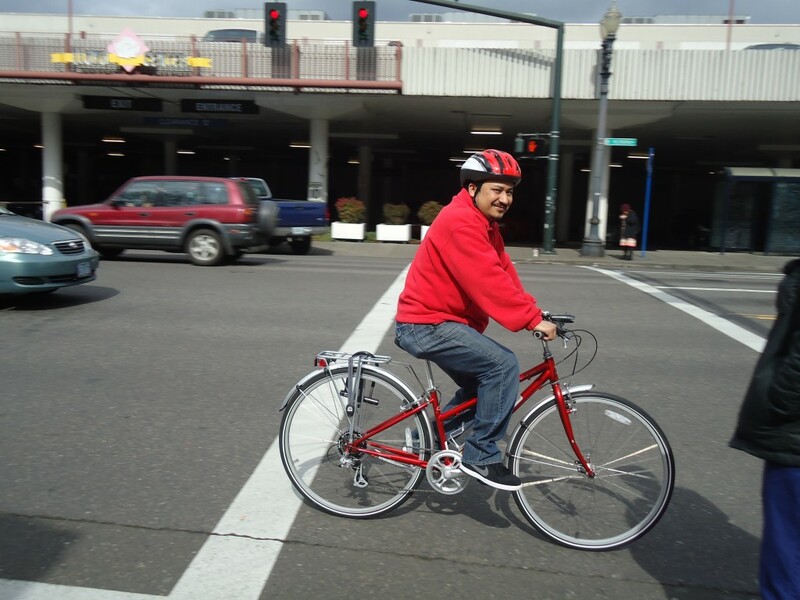 Rafael not only earned the bicycle he needed, he also learned how to navigate traffic respectfully and safely. Check out more photos from the Easter Seals Create a Commuter workshop.